We're sharing some valentine's day inspiration this week, and I thought I'd use a few non-valentine sets to create this ivy league-inspired card. I started out with a kraft base, and stamped the notebook image (from "schoolhouse backdrops") in white ink. Next, I stamped the library card image onto white cardstock and created a custom sentiment (using "smitty's ABCs"). For fun, I stamped the elements first in versamark ink, and then shadow-stamped them again in a darker ink. Just a little something extra. Just a super quick post, because I wanted to play around with today's card class assignment: creating one-layer cards. I slipped tiny little hearts into Libra's balances (from Mama Elephant's "cosmic stars" set) by way of - what else? - masking. I then stamped a custom sentiment around her, and colored the letters in with copics. Because smaller is definitely cuter. I stamped the bee, then masked the bee and the bottom half of the tiny card, and sponged blue ink over the top. Some pink accents, a matching sentiment, and glittery wings. Done. Hand-stamped enveloped sealed the deal. Stripes inside, hexes out. Actually, smaller-bee stickers sealed the deal. For reals. Even though I haven't moved, don't plan to move, hate the thought of moving, I created a thank you card for the newly-relocated, recently-gifted person. A new house thank you card. I used PTI's barn die to create my folded card, but chopped the barn roof so it looked like a regular house roof instead. I embossed the home with a striped embossing folder - I thought it looked a little cottag-y that way, like wood planks all across the front. The roof was the only tedious part of the project: I cut strips of paper with a scallop paper punch, and adhered them, starting at the base of the roof and working my way up. Before adhering them, I sponged all of the edges - I love the dimension that gives the paper. The Precious Remembrance sentiment is one big panel - isn't it cute? I colored in all of the squares (thank you for... the gift, being you, everything) but I added glossy accents to the square that reads: everything. It's much more obvious in real life, and a cute touch. Here's what I did with the tri-fold 2: I stamped it with the woodgrain background (from "background basics 1"), rubbed distress ink all over it, and then embossed the new doily image over-top. I inked up my stamp first in versamark ink, and then into my color, and sprinkled the stamped image with clear embossing powder. It's a subtle pop, compared with a colored embossing powder, but pretty nonetheless. Once open, the woodgrain pattern is present also, as well as a simple little valentine's day love-note. And a cookie. The mini tri-fold 2 die has room for embellishments or skinny treats - I love that! I colored the owl's belly a light pink, and the leaf a red/pink combination. The rest I left plain, since the envelope needed no competition. I started out with a black cardstock panel, and heat embossed florals from "in bloom." I colored the leaves with a green inktense colored pencil - they're amazing, the way they pop on dark-colored paper! I heat-embossed the blooms again on watercolor paper, and watercolored them with different inktense pencils. They were cut out, and layered with different heights of foam squares. That's it for me! Happy hopping, and thank you for popping over here! Are you a paper crafts magazine online subscriber? If you are, you've likely seen this snappy project in the current issue. It isn't in the paper pages - it's an online exclusive! A friend is due any day now with her first baby boy. My new Mama Elephant stamps were perfect for creating a little scene. I mixed some of the images from "cosmic stars" (the lion and the bull) with the teddy and giraffe from "nursery deco." A bunch of adorable stuffies on a nursery shelf. Some creative masking allowed me to have all but the giraffe sit flush on the shelf, and stamp a striped "wall" in that same layer. The giraffe and the alphabet art piece are popped up. Even though Monday mornings come too quickly, the ones that start with a new lawnscaping challenge are so much fun. I don't know what the weather looks like near you, but this week's "winter wonderland" theme is just perfect for where we are. Snow and ice - everywhere. I know I'm (very) late to the chalkboard party, but I was so inspired by some of Kara's pins (here, here, and here) that I decided to give it a go. I started out with a mat of black cardstock, and created my sentiment using lawn fawn alpha sets. I stamped the sentiment, and the polar bear (from "critters in the snow") in versamark first, and white-heat-embossed it all. One trick I picked up from Betsy Veldman - keep sprinkling embossing powder as you go along. I stamped my polar bear first, for placement, and sprinkled him with powder. Then, the word "cold" - sprinkled with powder. And so on. It really helped to take the stress off! I didn't feel like I needed to rush and throw the powder on before the versamark dried. Once everything was heat embossed, I went back in and stamped again: this time with white ink, and slightly to the left of the original impressions, to give a shadowed look. I added some snowfall, (from "let it snow") in white ink, without embossing any of it, and smudged the edges with more white ink. The best part of winter is layering cozy textures to keep warm. I added a felt snowflake and some soft yarn and attached them with a mini clothespin. I hope you play along! 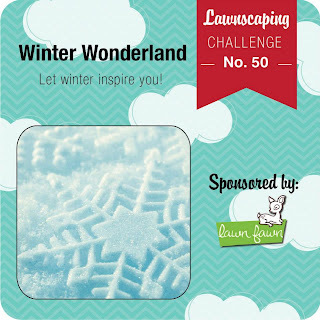 Both with Kara's challenge, and our latest lawnscaping challenge! Are you loving the new set from Precious Remembrance? Even though it's a "thank you" set, Dyane added some great sentiments that keep the set very all-purpose. I used the "I ♥ you" circle to create this cozy valentine's day card. The card background was stamped with a strip of PTI's text style II, and I actually broke out the sewing machine for this one. I haven't done that in awhile! Thanks for popping by (again!) Have a great weekend - after breakfast, I have a date with my favorite 5 year old. I ♥ spending time with each kidlet - it's so much quieter... ha. good things come in tiny packages. I am so excited to share the new CSS release with you: an airmail background set, a tiny envelope die, a new party favor die, and a notebook edge die - squeeeee! I had so much fun playing around with these goodies. I love the "to" and "from" that I added to the front and back of the tiny envies - they are from "trendy tags" and the perfect little accents to this set. On display is my favorite way to view this tiny gift set. Remember these art party decorations? I had a few requests for a silhouette tutorial on how to take a cut file and turn it into a print & cut. Please, pretty please keep in mind that I am new to the silhouette myself, so be kind. I couldn't let Valentine's day come and go without using the rag doll super hero set. And, when I saw *this card* on Joy Taylor's blog, I was inspired to make a black & white version of my favorite rag doll, with the pop of color in the sentiment. My little Thomas has 20 kids in his class... I've made 10 of these sweet tags so far :) They're tall enough to be used as a bookmark, or to be able to adhere a lollipop to the back. I started out with a piece of white cardstock, and stamped "super" first. I created masks for just the "u" and the "p" and stamped my rag doll with all of his superhero accessories (his mask, his cape, and his "s" for superhero!) I then borrowed "valentine's day" (I cut off the "it's" from the sentiment, from "sweet sentiments: holidays") and typed up "have a" on my computer. Click on the image to be taken to the app store, where you can download the CSS app for extra, not-seen-anywhere daily inspiration. I am (a little/very) late in posting this today, but with good reason: I only received my "thanks stamp set" in the mail after lunch (grumble, grumble... mailing to Canada is so slow), and couldn't resist settling down immediately to create a card with this fun bunch 'o stamps. Hope you like what I've created today! Click over to the Precious Remembrance blog to see what the other designers came up with! I'm so excited to be showing off the newest CSS release: medallions 1 and medallions 2 stamp sets. I had the best time getting inky and artistic and created full pages of my own designer papers. I changed up the stamps on every sheet, but kept to a grey/beige, pink, and light blue color scheme to make sure that everything coordinated. My best tip for creating diy patterned paper? Stamp the bigger elements first, and then fill in with the smaller ones. And, if you're scared of stamping a random design, why don't you do what I did and evenly space out your medallions? I plotted out my patterns, and erased the pencil lines when I was done. I've featured the patterns on this card - cut up my diy patterned papers and stitched them onto a raised panel. I also created a coordinating envelope liner. I used more of my diy paper in this embroidery hoop. I grabbed a naked embroidery hoop that I had lying around, gave it a coat of blue paint and fitted the inside with my favorite medallion design. The sentiment is perfect, and from the CSS set "rag doll mia: banner." I also stamped and cut out a butterfly from the "au naturel" set, to coordinate with my card, which featured another image from that set. When I set out to create the hoop, I didn't think I'd like it as much as I do - it's on display on my nightstand now, and makes me happy every time I see it. 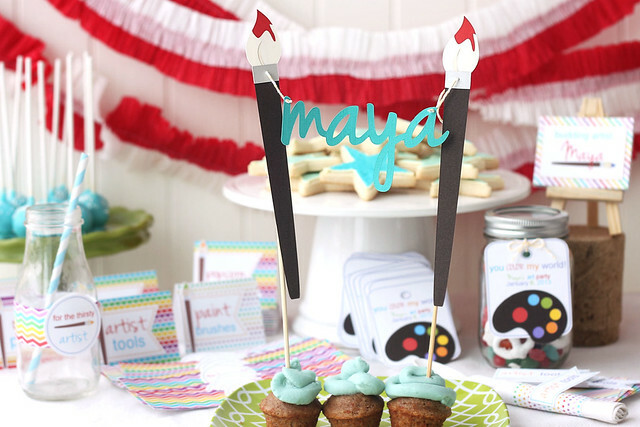 Over the holidays, I got to know my silhouette a bit better, and created these fun decorations for a special little girl's 4th birthday party. I love, love, love it when I get to work with the same mama for multiple parties. I created *this* ultra-girly ensemble for Maya's 3rd birthday party. I used this cut file to create all of the decorations you see in this post. I can't tell you how proud I am of myself for learning how to convert the cut file into a print & cut, so that it could be used throughout the party. The digital scrapbook papers were purchased from this shop. With the paintbrushes being so small on these dessert/tool labels, I didn't want the headache of assembling all of the pieces - turning the file into a print & cut was a great way to go! Love these water bottle labels. The "artist tools" held the kid cutlery together. Place-cards for each kid, held up on an artist's easel. They were going to be doing some painting at this party! The favor jars (I just threw together whatever multi-colored candies I had around the house for this photo, but I think she was gifting jars of crayons) with a brightly-colored tag. If you're new to the silhouette, and would like to know how I turned the cut file into a print & cut, let me know! Maybe I could put together a little tutorial. a gnomie birthday to you!